Coach Sean Payton said he can't "forecast the future" with Bryant, who is recovering from a torn Achilles, Mike Triplett of ESPN.com reports. The Saints placed Bryant (Achilles) on injured reserve Saturday, Nick Underhill of The New Orleans Advocate reports. Analysis: Bryant is expected to be out at least eight months, according to Adam Schefter of ESPN, but an official timeline will likely come after the wideout undergoes surgery to repair his torn Achilles. 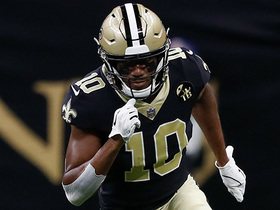 The Saints will move on with a depth chart that features Michael Thomas, Tre'Quan Smith, Austin Carr and Keith Kirkwood as their four healthy wide receivers. Bryant is expected to miss the next 8-to-12 months after an MRI confirmed Saturday that he suffered a torn Achilles' tendon, Adam Schefter of ESPN reports. Testing on Bryant's Achilles is viewed as a mere formality, with doctors expecting confirmation of a tear, Adam Schefter of ESPN reports. Bryant suffered what is believed to be a torn Achilles at Friday's practice, Tom Pelissero of NFL.com reports. 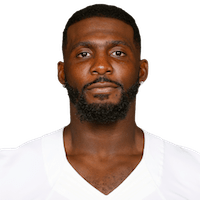 Analysis: While his Saints tenure may be in peril after signing with the team Wednesday, Bryant was listed on Friday's injury report as limited with an ankle injury, per Josh Katzenstein of The New Orleans Times-Picayune. Expect Bryant's status to receive further clarification following an MRI. Bryant isn't expected to play in Sunday's game against the Bengals, Tom Pelissero of NFL.com reports. Analysis: Bryant has only had two practice sessions to learn the offense since signing Wednesday, and the Saints reportedly want him to drop some weight before he plays in a game. Tre'Quan Smith should be in line for a heavy snap count against Cincinnati, with Austin Carr likely serving as the No. 3 receiver after Cameron Meredith (knee) was placed on injured reserve Thursday. The Saints presumably hope to have Bryant available for Week 11 against the Eagles. When asked Thursday morning, head coach Sean Payton did not reveal whether or not Bryant will play Sunday against the Bengals, according to Josh Katzenstein of The New Orleans Times-Picayune. Analysis: Bryant will have a chance to take the field in Week 10, but Payton said it was difficult to gauge his availability before seeing him practice. Payton figures to provide an update on Bryant's status either after Thursday's session comes to a close, or at least at some point prior to kickoff Sunday. Bryant agreed Wednesday with the Saints on a one-year contract, Ian Rapoport and Jane Slater of NFL Network report. Bryant and the Saints remain in negotiations on a contract after the wideout worked out for the team Tuesday, Tom Pelissero of NFL.com reports. Bryant is scheduled to work out for the Saints on Tuesday, Jane Slater of NFL Network reports. Suggests he plans to sign "soon"
In response to a question posed to Bryant via Twitter pertaining to when he might sign with a new team, the wideout tweeted "soon," UPI.com reports. Bryant indicated via Twitter on Sunday that he's interested in playing for New England or Washington, ESPN's Mike Reiss reports. Analysis: It remains to be seen if either team will roll the dice on the veteran wideout now that Week 1 has kicked off and any contract Bryant signs won't carry the same guarantees as if he had been on an opening-day roster. It's worth noting that the Patriots waived wide receivers Riley McCarron and Chad Hansen on Monday, but they've also kicked the tires on free agents Brandon Reilly and Kendall Wright, so those moves don't necessarily point to potential interest in Bryant. The Browns could re-engage with Bryant on contract negotiations at some point next week, Mary Kay Cabot of the Cleveland Plain Dealer reports. Bryant still expects to play football this year, but he admits it may not happen until later in the season. Analysis: Bryant turned down an offer from the Ravens during the offseason and wasn't able to reach an agreement after meeting with the Browns a couple weeks ago. He's otherwise struggled to draw interest since the Cowboys released him in mid-April, with teams perhaps turned off by his strong personality and lack of recent production. The 29-year-old may be worthy of a bench stash in deep leagues, but there's little reason to expect any contribution in September. Bryant isn't a priority for the Browns at the moment, Mary Kay Cabot of The Cleveland Plain Dealer reports. Bryant left Cleveland without a contract, but he'll continue discussions with the Browns, Mary Kay Cabot of The Cleveland Plain Dealer reports. Bryant is optimistic about getting a deal done with the Browns, the Cleveland Plain Dealer reports. Analysis: Per the report, the free agent pass-catcher hopes to sign a one-year "prove-it'" deal with Cleveland. If that's accurate, it's something that can and probably should happen, with the Browns dealing with some uncertainly at wide receiver behind Jarvis Landry. Bryant is scheduled to meet with the Browns on Thursday, Dianna Russini of ESPN reports. Bryant tweeted Thursday that he will begin visiting teams next week, including the Browns. Analysis: Bryant doesn't seem to be in too much of a hurry, saying he's still in the process of getting himself ready for the upcoming season. Cleveland became an obvious fit after Corey Coleman was traded to Buffalo and Antonio Callaway was cited for marijuana possession, but Bryant also figures to weigh other options in his search for a new team. The 29-year-old is believed to be seeking a one-year contract. Bryant was spotted at the Patriots' training camp Wednesday, Adam Schefter of ESPN reports. Analysis: The timing of Bryant's visit with New England is interesting given the team's placement of Jordan Matthews (hamstring) on injured reserve earlier Monday. The Patriots also recently worked out another veteran receiver in Eric Decker, though he left the facility without a contract. While it isn't yet clear if Bryant has left unsigned as well, the ex-Cowboy would seemingly be a great fit in a New England offense that doesn't have a clear No. 2 wideout for the first four weeks of the regular season. Browns general manager John Dorsey said his team has discussed adding Bryant to the roster, Nate Ulrich of the Akron Beacon Journal reports. Bryant likely will wait until after the 2018 NFL Draft to sign with a team, Ian Rapoport of NFL Network reports. Bryant is unlikely to draw interest from the Ravens after the team signed Willie Snead to an offer sheet, Jamison Hensley of ESPN.com reports. Bryant sounded excited about the idea of playing for the Giants in an interview with Mike Fisher of 105.3 The Fan in Dallas, NFL.com's Kevin Patra reports. Bryant could be a fit with the Bills, Cardinals, Ravens and Packers, Adam Schefter of ESPN reports. Bryant was released Friday by the Cowboys following a brief meeting with team owner Jerry Jones, Ian Rapoport of NFL Network reports. Bryant likely will be released by the Cowboys on Friday, Adam Schefter of ESPN reports. Bryant will meet with owner Jerry Jones by the end of the week, David Moore of The Dallas Morning News reports. Bryant still hasn't met with head coach Jason Garrett or owner Jerry Jones to discuss his future with the Cowboys, Nick Eatman of the team's official website reports. Cowboys executive vice president Stephen Jones said Allen Hurns wasn't signed as a replacement for Bryant, also noting that the team still needs to talk to the 29-year-old wideout about his contract, David Moore of The Dallas Morning News reports. 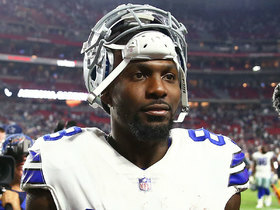 Bryant's future with the Cowboys appears murky after the team signed Deonte Thompson on Thursday and Allen Hurns on Friday, ESPN.com's Todd Archer reports. The Cowboys haven't reached out to Bryant's agent to discuss any changes in his contract, Ian Rapoport of NFL Network reports. Bryant is expected to remain a Cowboy during the 2018 season, Brandon George of The Dallas Morning News reports. Bryant caught three of eight targets for 24 yards in Sunday's 6-0 win over the Eagles. Analysis: It's now been three seasons since Bryant reached the 1000-yard plateau, but unlike 2015 and 2016, he doesn't have an injury to excuse his decline. He just turned 29 in November, so it might be too soon to write him off, but with the Cowboys offense now firmly focused on Ezekiel Elliott and the ground game, it may be tough for Bryant to ever again produce numbers comparable to his peak when he was catching goal-line fades from Tony Romo on a regular basis. Bryant (knee) was a full practice participant Friday and doesn't have an injury designation for Sunday's game in Philadelphia, Rob Phillips of the Cowboys' official site reports. Analysis: Bryant was a mid-week addition to the injury report after missing Thursday's practice with knee tendinitis, an issue he said has been bothering him since Week 9. He should be fine for his usual role in the regular-season finale, facing an Eagles defense that may eventually rest some starters. Bryant was unable to practice Thursday due to a knee injury, David Helman of the Cowboys' official site reports. Bryant wasn't in attendance for the portion of Thursday's practice that was available to the media, Kate Hairopoulos of The Dallas Morning News reports. Bryant caught three passes for 44 yards on six targets against Seattle on Sunday. Analysis: Dak Prescott was only able to total 182 yards and two interceptions on 34 pass attempts, so there wasn't much to go around for the pass catchers. As has generally been the case this year, Bryant struggled to get open and appears to be in a state of at least slight decline. He gets a tough matchup on the road against the Eagles next week. Bryant caught three of five passes for 73 yards and a touchdown during Sunday's 30-10 win over the Giants. Bryant brought in five of seven targets for 61 yards and a touchdown in Thursday's 38-14 win over the Redskins. Bryant caught three of five targets for 37 yards in Thursday's 28-6 loss to the Chargers. Analysis: It was his lowest target volume since Week 3, and Bryant has now failed to score a touchdown in five straight games, the longest in-season scoring slump of his career. 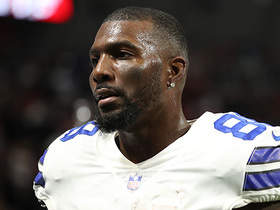 With injuries mounting on the Cowboys' offensive line and Dak Prescott in a funk, Bryant's opportunities to break out of his own slump could remain limited. Bryant secured eight of 14 targets for 63 yards during Sunday's 37-9 loss to the Cowboys. Bryant (knee) doesn't have an injury designation for Sunday's game against the Eagles, Jon Machota of The Dallas Morning News reports. Bryant (knee) was a full participant at practice Thursday, Jane Slater of NFL Network reports. Analysis: In his return to drills, Bryant shed any question about his ability to play through a knee injury Sunday against the Eagles with an uncapped session. The matchup could provide plenty of opportunity for targets, as Philly's opponents have more often than not been in catch-up mode this season. Cowboys head coach Jason Garrett indicated that Bryant (knee) will practice Thursday, Jon Machota of The Dallas Morning News reports. Analysis: Bryant's practice reps have been managed carefully in the Cowboys' four official practices since their Week 9 win over the Chiefs, a game in which the wideout sustained knee and ankle injuries. Though it appears only the former issue is bothering Bryant at this stage, the Cowboys could opt to limit his involvement during Thursday's session. Even so, Bryant seems to be trending toward suiting up and taking on a full workload Sunday against a vulnerable Eagles pass defense. Bryant (knee) didn't take part in practice Wednesday, David Helman of the Cowboys' official site reports. Analysis: The Cowboys appear to be in preservation mode with their most important skill-position player following the suspension of Ezekiel Elliott, outside of Dak Prescott. As evidence, Bryant followed a DNP/DNP/limited practice regimen last week, which may be replicated over the next couple days. If he does return to drills Thursday and/or Friday, he'll be in line for numerous targets Sunday against the Eagles' 26th-ranked pass defense. Bryant (knee/ankle) wasn't present for the portion of Wednesday's practice open to the media, Todd Archer of ESPN.com reports. Bryant caught four of eight pass attempts for 39 yards in Sunday's 27-7 loss to the Falcons. Bryant (knee) is active for Sunday's game at Atlanta, Todd Archer of ESPN.com reports. Analysis: Outside of Dak Prescott, Bryant is the best bet to be the centerpiece of the Cowboys' offense during Ezekiel Elliott's six-game suspension. After brushing off knee and ankle injuries, Bryant will attempt to exploit a Falcons defense that has allowed 12.2 YPC and four touchdowns over the last four contests. 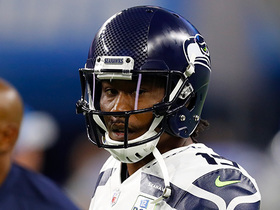 Bryant (knee/ankle) is expected to be a "full go" Sunday in Atlanta, Ed Werder reports. Analysis: With Ezekiel Elliott beginning his six-game suspension, Bryant is easily the most-talented skill-position player at Dak Prescott's disposal moving forward. Bryant has yet to reach the 100-yard threshold this season, but the absence of Elliott may force the Cowboys' offense to the air it out more often against the Falcons' 10th-ranked pass defense. Bryant (knee/ankle) has said he will play Sunday against Atlanta, Adam Schefter of ESPN reports. Analysis: After missing practice the first two days of the week, Bryant returned as a limited participant Friday and was listed as questionable on the final injury report for Sunday's game in Atlanta. He was said to be moving well in practice Friday, so this report adds to the outlook that he will play. However, fantasy owners should check his status before Sunday's 4:25 p.m. ET kickoff. Bryant (knee/ankle) was moving well during Friday's practice, Brandon George of The Dallas Morning News reports. Bryant (knee/ankle) is listed as questionable for Sunday's contest at Atlanta, The Dallas Morning News reports. Analysis: Bryant returned to drills in a limited capacity Friday, but his array of lower-body ailments will keep his playing status in question heading into the weekend. Expect his availability to be cleared once and for all upon the release of the Cowboys' inactive list 90 minutes before Sunday's 4:25 PM EDT kickoff. Head coach Jason Garrett expects Bryant (knee) to practice Friday, David Helman of the Cowboys' official website reports. Analysis: Bryant was unable to practice either Wednesday or Thursday, so any level of participation at Friday's session would be a boon for his Week 10 status. More details regarding his availability for Sunday's matchup with the Falcons should emerge later Friday. Bryant (knee/ankle) didn't practice Thursday, The Dallas Morning News reports. However, he's expected to practice Friday and suit up Sunday at Atlanta, according to Jon Machota of The Dallas Morning News. Analysis: Assuming he upholds his prediction and takes the practice field Friday, Bryant will have a great chance to play through an ankle sprain and bruised knee Week 10. His services are in greater demand following Thursday's legal ruling on Ezekiel Elliott, whose six-game suspension was reinstated. Bryant's upcoming matchup against the Falcons may be a difficult one, though, as they've conceded 7.0 YPT and seven touchdowns in eight games to wide receivers this season. Cowboys head coach Jason Garrett said that Bryant (knee/ankle) will be no more than a limited participant at best in the team's practice Thursday, Brandon George of The Dallas Morning News reports. Cowboys head coach Jason Garrett said Bryant is dealing with a sprained ankle and bruised knee and will be held out of practice Wednesday, Brandon George of The Dallas Morning News reports. Analysis: Bryant suffered the injuries while trying to haul in a reception during Sunday's win over the Chiefs, resulting in his early departure from the contest. According to Jon Machota of The Dallas Morning News, Cowboys owner Jerry Jones said Wednesday that Bryant's availability for the Week 10 matchup with the Falcons is uncertain, but the wideout's participation level in practices Thursday or Friday should carry more weight regarding his status. Cowboys head coach Jason Garrett said Monday that Bryant is nursing a knee issue in addition to his ankle injury, Todd Archer of ESPN.com reports. The ankle injury Bryant suffered in Sunday's win over the Chiefs was described as "not serious," Ian Rapoport of NFL Network reports. According to head coach Jason Garrett, Bryant has a sprained ankle, Damon R. Marx of The Dallas Morning News reports. Bryant is questionable to return to Sunday's game versus the Chiefs due to an ankle injury, Jon Machota of The Dallas Morning News reports. Analysis: According to Todd Archer of ESPN.com, Bryant was "dinged up" on a hit during the Cowboys' second touchdown drive of the second half. Bryant was subsequently examined by team doctors while his teammates culminated the drive with Cole Beasley's second TD of the game. If he's unable to return, Bryant will finished the game with six catches (on 11 targets) for 73 yards. Bryant (knee) was a full practice participant Friday and doesn't have an injury designation for Sunday's game against the Chiefs. Analysis: Bryant was limited at Wednesday's practice but managed full sessions Thursday and Friday. He should be fine to handle his usual heavy workload, hoping to turn it into his first truly big game of the season against a Kansas City defense that's given up a league-high 13 touchdowns to wide receivers. Bryant has four scores in seven games, but he's only topped 63 receiving yards once, despite drawing 9.1 targets per game. Bryant (knee) turned in a full practice Thursday. Analysis: Prior to the session, head coach Jason Garrett told Jon Machota of The Dallas Morning News that Bryant's knee was bothering him near the end of Wednesday's practice, hence the limited designation. With a return in full Thursday, Bryant appears good to go for Sunday's showdown with the Chiefs, who have allowed a league-high 13 touchdowns to wide receivers this season. Cowboys head coach Jason Garrett said that Bryant (knee) is expected to practice again Thursday, Jon Machota of The Dallas Morning News reports. Analysis: Bryant was listed as a limited participant during the Cowboys' first practice of the week Wednesday, but Garrett suggested the wideout had been in line for a full session before his knee started to bother him toward the end of the practice. The fact that Bryant will hit the field a day later suggests the knee isn't much of a concern, but the Cowboys could elect to limit his involvement Thursday in any case. Bryant's availability for Sunday's game against the Chiefs doesn't seem to be at risk. Bryant was limited in practice Wednesday due to a knee injury. Analysis: Bryant has contended with knee injuries on and off for the better part of the past two years, so his appearance on the Cowboys' Week 9 injury report could be maintenance-related. Fortunately, he was able to practice in some capacity Wednesday, setting himself up for a full practice by the end of the week, if his health allows it. 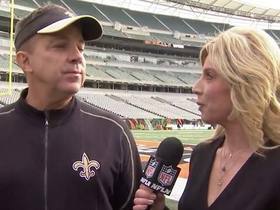 NFL Network's Kim Jones goes one-on-one with New Orleans Saints head coach Sean Payton, and gets his reaction to wide receiver Dez Bryant being out for the remainder of the season. 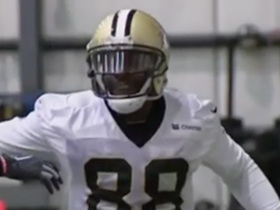 NFL Network Insider Ian Rapoport has the latest on the future of New Orleans Saints wide receiver Dez Bryant. NFL Network's Tom Pelissero discusses the initial diagnosis for New Orleans Saints Dez Bryant's torn Achilles injury. The "NFL Fantasy Live" crew offers several alternatives on the waiver wire in case you were one of the people who lost New Orleans Saints wide receiver Dez Bryant. 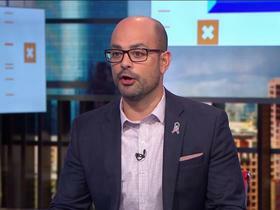 NFL Network Insider Ian Rapoport discusses if the New Orleans Saints would consider bringing in wide receiver Brandon Marshall after the injury to their wide receiver Dez Bryant. NFL Network's Tom Pelissero has the latest news on New Orleans Saints wide receiver Dez Bryant's injury during practice. NFL Network's Tom Pelissero discusses the chances that New Orleans Saints wide receiver Dez Bryant will play in Week 10 against the Cincinnati Bengals. 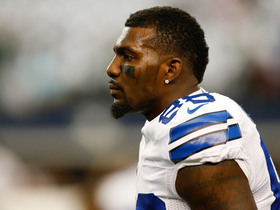 Dallas Cowboys wide receiver Dez Bryant left the field early during the Cowboys' 37-36 loss to the Green Bay Packers. Witness the events of the last-minute defeat through Bryant's microphone. Check out some of the sounds from Dez Bryant during the Cowboys game against the Bears. 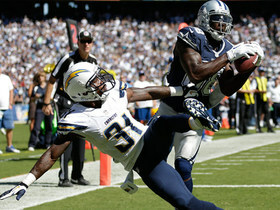 Dallas Cowboys wide receiver Dez Bryant made an amazing touchdown grab over a San Diego Chargers defender. Check out who else leaped their way onto the top 5 catches from Week 4.